A collar or belt fits properly when it is buckled comfortably around the body part in question. This distance around the body part is the buckled length. Many people want to tell me the total length of their dog's old collar or their trouser belt. Or they want me to use their pants size as the belt length. You will just have to trust me on this -- I cannot make a collar or belt using total length or pants size. Your belt or collar will fit only if I know the buckled length required. Please measure carefully -- collars and belts are not returnable for refund or exchange, unless we have made an error. Recommended for collars and belts: If you have a good fitting collar (or belt), measure it for the most accurate results. If the strap has a traditional buckle, note the hole that the buckle is fastened onto when it is on your dog (or your waist). 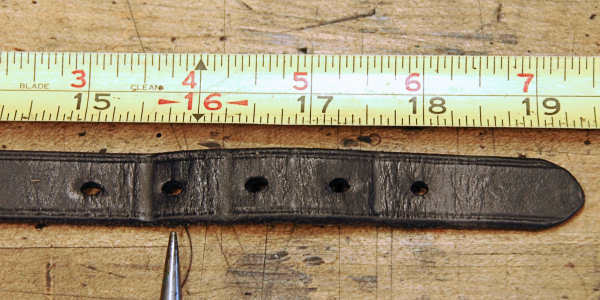 Measure from the tip of the buckle tongue (Photo 1, below ) to the hole that the buckle was fastened onto (Photo 2, below ). If the buckle is a two-part quick release type, note where the two buckle parts meet when the buckle is snapped together. Make sure the collar or belt fits properly, then measure the distance between the two "faces" where the buckle parts meet when snapped together. Acceptable for collars: If you do not have a good fitting collar, use a soft tape measure to measure the distance around your dog's neck. (Don't have a soft tape measure? Use a string instead, and measure the string with a ruler.) Take the measurement about halfway between the base of your dog's head and top of his shoulder. Measure for a "trim fit" -- not choking tight, not sloppy loose. This is the buckled length of your dog's collar. Acceptable for belts: If you do not have a good fitting belt, put on the pants or jeans you plan to wear with the belt. Adjust the waistband so it lies normally. Slip a string, neck tie, or soft tape measure through your belt loops, just like a belt, and pull it just barely snug. Measure the length going around your body. This method will tend to underestimate the length needed for a belt to fit comfortably, so you may want to add an inch or two to the measurement. Better than nothing for belts: If you absolutely cannot measure for a belt, estimate the correct length by adding 2 to 4 inches to the waist measurement of well-fitting, recently purchased pants or jeans. Larger folks should consider adding 3-4 inches; slender folks may be fine with 2-3 added inches. Since waistbands tend to stretch with age, you should keep in mind this method will also tend to underestimate the length needed for a belt to fit comfortably. How your measurement will be used: The length measurement you give me will end up being the distance around the inside of your new collar (or belt) from the buckle tip to the center hole, unless you and I decide otherwise. I will add some inches to the buckled length to allow for adjustment and to make a nice looking tip that is long enough for the buckle that will be installed on the strap. (Photo 2, below ). Photo 2. ...to the hole we normally use to buckle this collar on her. I usually buckle this collar on the second hole from the left, so the buckled length is about 16 inches. The 16 inch measurement is what I would use to make Daisy a new collar. 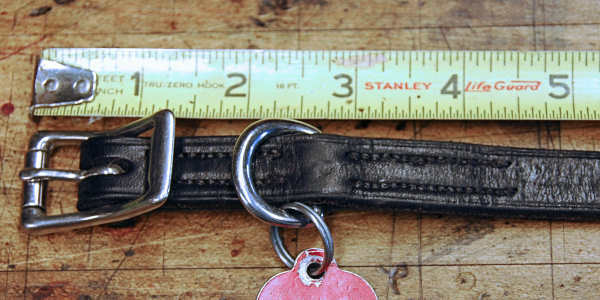 I would adjust the length of her new collar, however, so the distance from the buckle to the center hole is 16 inches. I will make your collar or belt just the same. There will be two holes on either side of the center hole (a total of 5 holes, just as shown here), so you can fine-tune the fit. The distance between the holes will vary depending on the width and intended use of the strap.